During the 1980s – a decade which generally has a lot to answer for – there was somewhat of a rugby song revival. One of our most enduring anthems evolved when Murray Grindlay was commissioned by a Wellington advertising agency to write a song to play over the speakers at All Black games for the crowd to sing along to. 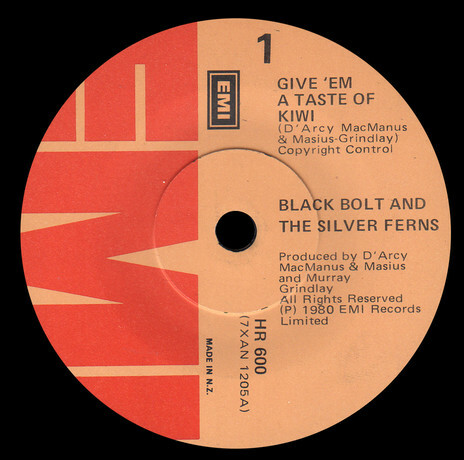 Grindlay wrote ‘Give Em A Taste of Kiwi’ and sang the song as well, under the guise of Black Bolt and The Silver Ferns. Released as EMI single HR 600, the song only reached No.36 on the national charts but has remained one of our most enduring sporting anthems. 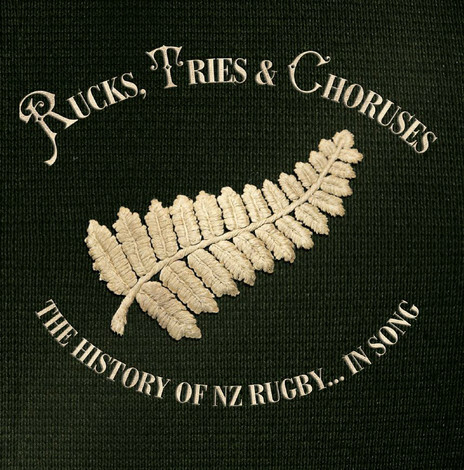 The record was associated with the All Blacks for a few years before rugby league – which was pinching the best All Black players during the pre-professional period – got its hands on the song and used it as their anthem for a long period. Provincial pride was on the rise during the 1980s. 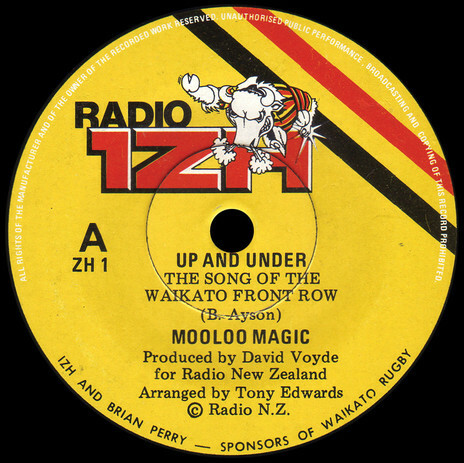 Mooloo Magic recorded the single ‘Up And Under (The Song Of The Waikato Front Row’) in conjunction with Waikato radio station 1ZH and principal sponsor Brian Perry. Waikato was on a roll at the time after wrestling the Ranfurly Shield from Auckland in a gigantic tussle during the 1979 season. On The Decline and Fall of Say Yes to Apes the Christchurch group Say Yes to Apes (which included the actor Kevin Smith) included ‘A Bawdy Rugby Song’. Released in 1983 on TV Eye, the recording was only the second double-LP released by a New Zealand group; it also included a comic book. Although not commercially released, legendary Wellington radio DJ Keith Richardson recorded three tracks with his breakfast show team supporting both the Wellington team and All Blacks’ game against the 1983 Lions in Wellington. The elephant in the room regarding world rugby for decades was the South African apartheid system, which reared its ugly head again in 1985 with a planned All Black tour to South Africa. Coming just four years after the divisive tour of 1981, there were major internal objections for the tour. 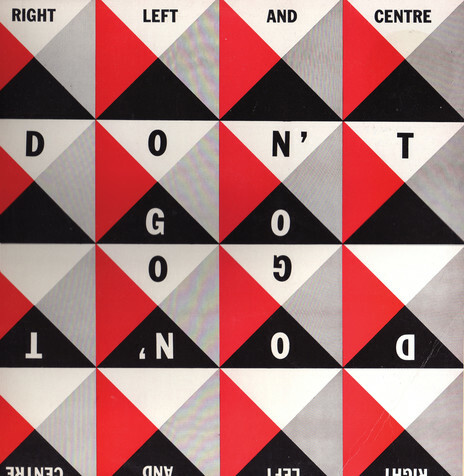 Protest song ‘Don’t Go’ was the brainchild of Frank Stark, an Auckland journalist and musician. Channelling ‘We Are the World’, he enlisted his friends, musician Don McGlashan and writer/musician/activist Geoff Chapple, to help write a song to galvanise opposition to the planned tour. The resulting record – produced by McGlashan and Stark and released under the name of Right, Left and Centre – was fronted by singers Chris Knox, Rick Bryant and McGlashan. Musicians included guitarists Chuck Morgan, Ivan Zagni and Mark Bell; singers Annie Crummer and Kim Willoughby and a large chorus of friends, anti-tour veterans and artists, including painter John Reynolds, Dame Cath Tizard and Hamish Keith. The song achieved what it set out to do by drawing public attention to the subject and as a bonus it reached No.2 on the national charts. The tour was eventually stopped by a team of lawyers fronted by Philip Recordon and Patrick Finnigan, who successfully brought a case against the New Zealand Rugby Union. However a private tour by a group called the New Zealand Cavaliers went ahead in 1986, led by Jock Hobbs and Andy Haden. To counter the argument, a group called The Silent Majority released the single ‘Let Them Go’ to protest the protest song over the proposed All Black tour. The B-side of the record is titled ‘The Protesters Victory March’ and is four minutes of silence written by RU Kidding. 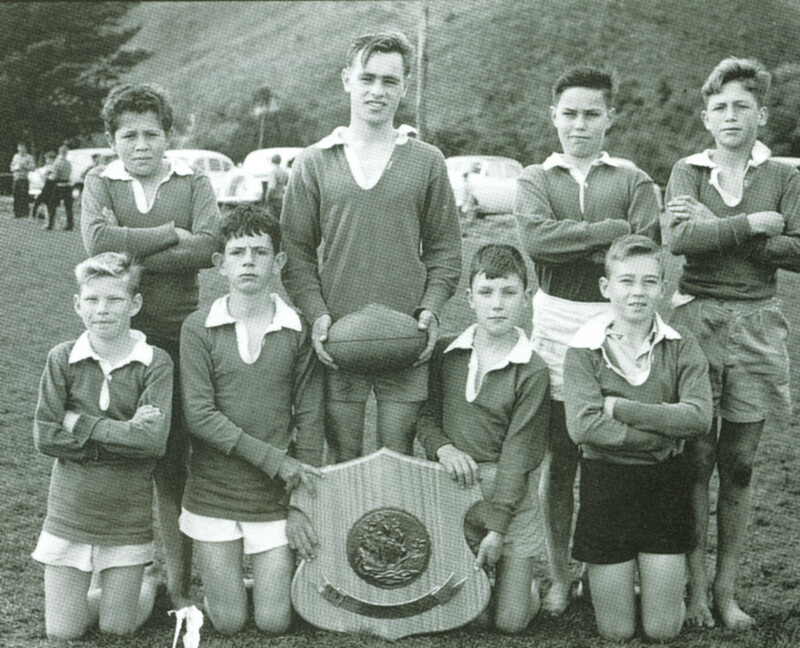 In late 1986 Dave Dobbyn’s soundtrack to Footrot Flats included ‘I Dream of Rugby’, a choral epic featuring the Sacred Heart College choir, a pipe organ and orchestra, and lines like “Kill them …”. 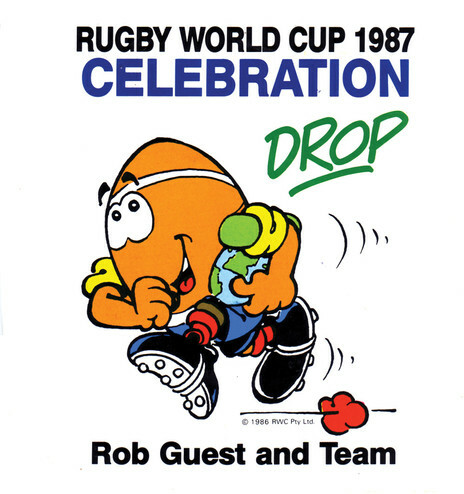 More conventional was Rob Guest and Team’s song for the inaugural 1987 Rugby World Cup, ‘Celebration’. Despite the All Blacks’ success, the song did not chart. 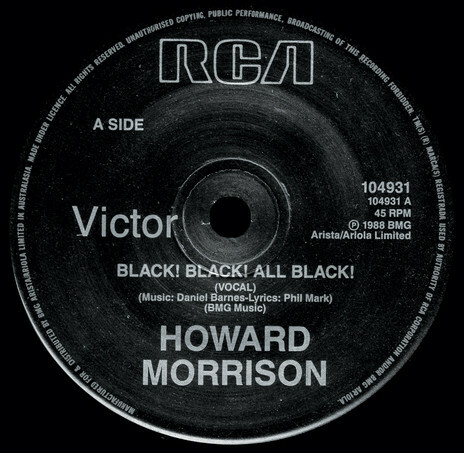 In the wake of their victory, however, Howard Morrison released ‘Black Black All Black’, a song written by Daniel Barnes. Produced by Billy Karaitiana, the recording included Bunny Walters, Ray Woolf and Hammond Gamble on backing vocals. This would have been a great honour for Morrison as his father Temuera was a Maori All Black who played alongside George Nepia. Howard Morrison – with guest vocals by Bunny Walters and Hammond Gamble – recorded ‘Black! Black! All Black!’ in 1988. It was released by RCA. 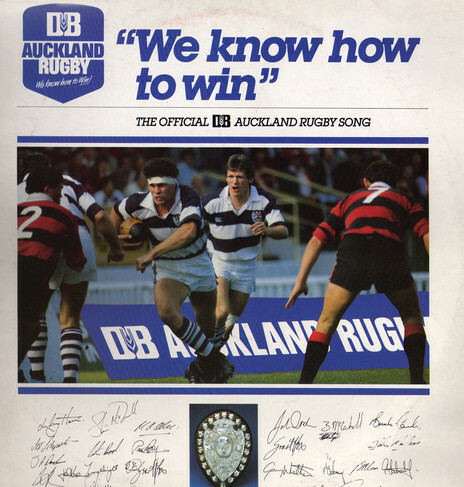 Also in 1987, producer Alan Galbraith was commissioned to write and record an official song for the Auckland Rugby Union who were in the process of building an impenetrable fortress around the Ranfurly Shield and were on their way to repulsing a record 61 challenges over an eight-year period. Galbraith came up with ‘We Know How To Win’, which in hindsight was a bit of an understatement. Bunny Walters and Hammond Gamble joined Galbraith on vocals; with the song recorded and in the can, it dawned on him that no provision had been made to record a flipside. With studio time running out, he quickly wrote the country-tinged ‘The Great Kiwi Game’ in the studio, based on his own childhood memories of playing rugby. Little is known about an act who released a single on Ode in 1987, Buddy Oath & Mates. ‘Rugby is the Greatest’ was the A-side; on the flip was an ‘Almost X-Rated Party Version’. The 1990s do not seem to have sustained the same momentum in rugby-related recordings. Late in the decade, the New Zealand Rugby Union began a “black out” campaign, encouraging fans to dress all in black; the union also started to use the Rolling Stones song ‘Paint It, Black’ at games. Neil Finn’s inscription on the back of his 1999 CD single ‘Can You Hear Us’ says, “This song is a simple gesture of support to the All Blacks for their 1999 World Cup campaign from me, a fan who was always too skinny to make the team”. 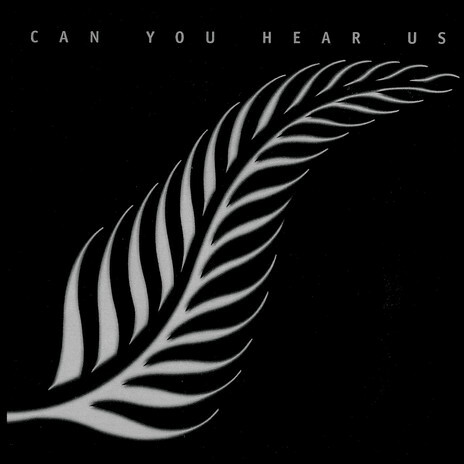 ‘Can You Hear Us’ was recorded at Finn’s Roundhead Studio and featured The Exponents rhythm section of Dave Gent and Harry Harrallambi, along with Liam Finn on guitar and Tim Finn and Sean Fitzpatrick on backing vocals with Te Waka Huia. On the back of a well-produced Kiwiana-laden video clip, the song debuted on the New Zealand charts during the same week as the tournament started and reached No.1 as we were raking up the victories in the heats and quarter finals before disappearing forever after New Zealand’s shock semi-final loss to France. So the song that should have lasted forever has now been virtually forgotten, with even Finn loath to talk about it. A curiosity, also from 1999, is an EP by an all-female “alternative rock” trio Jewl of Bessamoocho, who hailed from Kerikeri in the Bay of Islands. Among the four tracks on Diggadiggadigga was ‘Anti Rugby’. 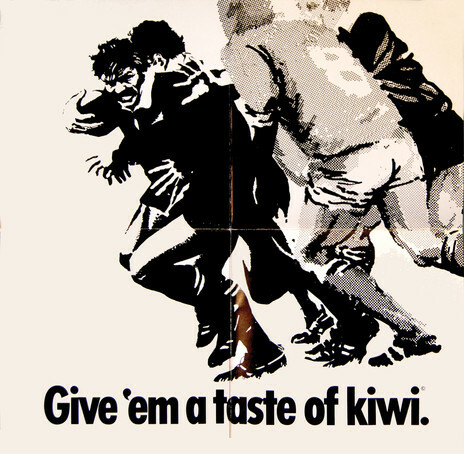 The man who gave us ‘Give Em A Taste of Kiwi’, Murray Grindlay was commissioned by advertising agency Whybin TBWA, to compose a song to support the All Blacks for the 2003 Rugby World Cup. In just over two hours he came up with the Celtic tinged ‘Haere Ra’ as sung by Fiona McDonald; Murray McNabb played the keyboards. It was released by EMI as an “interactive CD” with footage of the All Blacks performing a haka (and links to the website of sponsor Adidas). In 2005 the British and Irish Lions rugby team toured New Zealand. Ian Morris was commissioned by J Walter Thompson Advertising to compose the soundtrack for a new TV ad for the All Blacks principle sponsor, Ford Motors. As Morris – a dedicated fan of English football – explained at the time, “The soundtrack, to be honest, had a somewhat painful birth, going through several styles and revisions until agency creative Andrew Sadlier hit upon the phrase ‘My Black Jersey’ to signify the pride and passion that we in New Zealand feel for our rugby heroes. In 2007 balladeer Deane Waretini of ‘The Bridge’ fame wrote and recorded his song ‘Rugby World Cup’ as inspiration for the 2007 Rugby World Cup which is a popular YouTube clip. A wave of controversy preceded the 2011 Rugby World Cup to be held in New Zealand. A cover of the Jesus Jones song ‘Right Here, Right Now’ had been recorded by New Zealand band The Feelers as an ad campaign for sales, and many nationalists were appalled at an overseas song being used. World Cup CEO Martin Snedden tried to quell the disgust by announcing that ‘Right Here, Right Now’ was not the official anthem, it was only chosen to appear in advertisements, hence the message in the chorus ‘Right Here, Right Now’. The official Rugby World Cup song was ‘World In Union’, he said, and had been the theme of the past five world cups, with Hayley Westenra singing the 2011 version. Snedden added, “New Zealand music would feature extensively during the tournament, there will be a heap of opportunities throughout for New Zealand artists to be showcased and we will be taking those opportunities”. The general public and the media were either not listening and/or failed to comprehend Snedden’s comments, and still held on to the belief that ‘Right Here, Right Now’ was somehow an official anthem. A national public and media furore followed. Gary McCormick started a petition while Paul Holmes and other media outlets started a poll to find a suitable and locally written song. Everything from Dave Dobbyn’s ‘Loyal’ to The Exponents’ ‘Why Does Love Do This To Me’ were mooted. 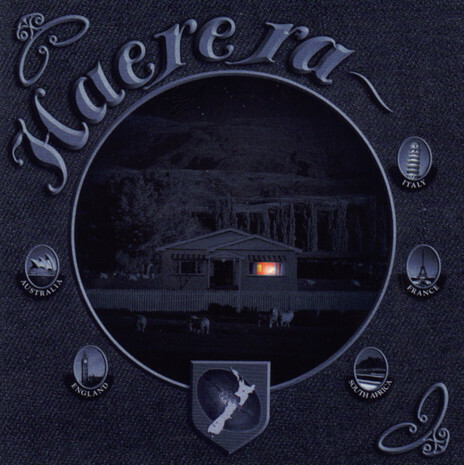 One song that kept getting mentioned was Franko Heke’s ‘We Are One’, although it was not written as a Rugby World Cup anthem. Franko wrote it to galvanise the country and remind New Zealanders they could beat the world: the message and lyrics that struck a chord. Another New Zealander who wanted to produce an anthem for the All Blacks for the 2011 World Cup was London-based Bryce Taylor. A part-time singer/songwriter, full-time All Black fan and former manager/coach of Susan Devoy, Taylor envisaged a harmonious blending of voices and a strong Maori/Polynesian thread, accompanied only by acoustic guitar and traditional drums. Having a Maori/Polynesian influence was not a handicap in London as Bryce was able to recruit Vai Mahutariki on backing vocals and for the main haka chant. Also on backing vocals was Tama Kirikiri was and Taylor’s daughter Olivia (who stars in the UK TV drama Wild At Heart. It was produced by Steven Williams (who also played “war drums”) and recorded at his famous Chapel Recording Studios in Wimbledon. A song recorded specifically for the 2011 World Cup was the powerful and emotive ballad ‘Game of Our Lives’. Performed by John Rowles, the song was written by Reece Kirk and Mike Harvey. Kirk had previously written the Mark Williams single ‘Sweet Wine’ and Crystal Gayle’s No.1 country hit ‘Our Love Is On The Fault Line’. The song was recorded at Stebbing’s Studios with Rowles’s two young sons Dane and Blake appearing on the track, after being coached by their mother Deborah Leigh-Ashton. (The session was also a reunion for Harvey and Rowles, who worked together during the late 1970s and early 1980s.) Rowles’s father Eddie was a Maori All Black from 1934 to 1938 and played against George Nepia several times during the 1930s. Not all songs leading up to the 2011 Rugby World Cup were of the chest-beating patriotic variety. Two songs released that year harked back to the parody releases of earlier decades. A Radio Sport host Miles Davis cleverly wrote new words to Smokie’s 1976 hit record ‘Living Next Door To Alice’ and renamed it ‘24 Years’, in reference to the period since the All Blacks had last won the RWC. 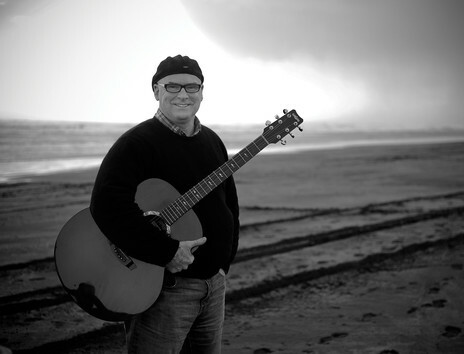 Davis rewrote the lyrics in 90 minutes during a flight from Invercargill to Auckland. Having only a marginal singing voice, he teamed up with Rikki Morris, Exponents guitarist Brian Jones, Ross Hollands, Steve Maric and Nick Johnson. The single chalked up good sales when released digitally under the band name ‘Heimlich Manouevres In The Park’. Wellington musician Murray Costello (ex The Mockers and Let’s Planet among others) wrote a singalong anthem, ‘I’ll Never Be An All Black’. It was an ode to everyone who had visions of becoming an All Black but never made the cut, which is nearly all of us. 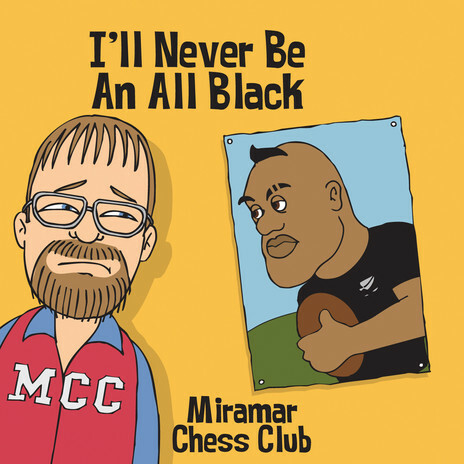 Credited to the Miramar Chess Club, the song featured rugby commentators Keith Quinn, John McBeth, Grant Nisbett, Graeme Moody and the late Winston McCarthy, while Quinn re-created his unforgettable “Jonah Oh Oh Oh” commentary on Jonah Lomu’s sensational try against England in the 1995 World Cup. The song was accompanied by a video by award-winning Kapiti Coast animators The Simmonds Brothers. In 2015, chart-topping New Zealand trio Sol3 Mio reworked Ed Sheeran’s ‘I See Fire’ song into New Zealand’s rugby anthem for the 2015 Rugby World Cup in London. They incorporated Sheeran’s original song from The Hobbit: The Desolation of Smaug, and chants from the traditional ‘Ka Mate’ haka. Well into extra time, rugby songs continue to appear, 130 years after ‘On the Ball’. Read On the Ball, part one of this story.